This modern tapestry "View of Tuscany" shows a modern rendition of the Tuscan hills. Here we see the Italian hillside of poplar trees and villas surrounded by an abstract border of leaves which subtly blend into the scene. The work makes use of muted tones and color palette. 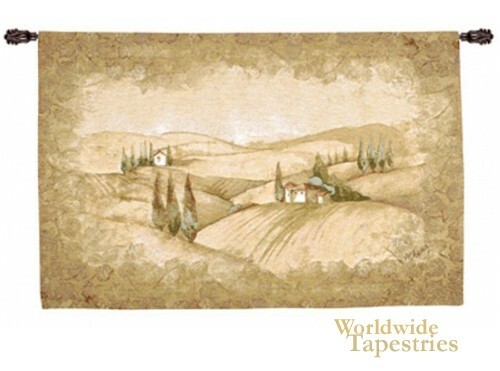 This modern landscape art tapestry "View of Tuscany" is backed with a lining and has a tunnel for easy hanging. Note: tapestry rod, where pictured, is not included in the price. Dimensions: W 54" x H 40"